The research, led by The Open University (OU) in collaboration with academics at the University of British Columbia, Leeds University and institutions in Brazil, Sweden and the USA, determined the source of nearly 20 million tonnes of atmospheric methane that had previously been unaccounted for. Ed Hornibrook, professor and head of Earth, Environmental and Geographic Sciences at UBC’s Okanagan campus, is one of the study’s authors. What is this methane and how did it go missing in the first place? Over the past decade, researchers have used satellite data and models to show that between 40 and 50 million tonnes of methane enters the atmosphere each year from the Amazon basin. 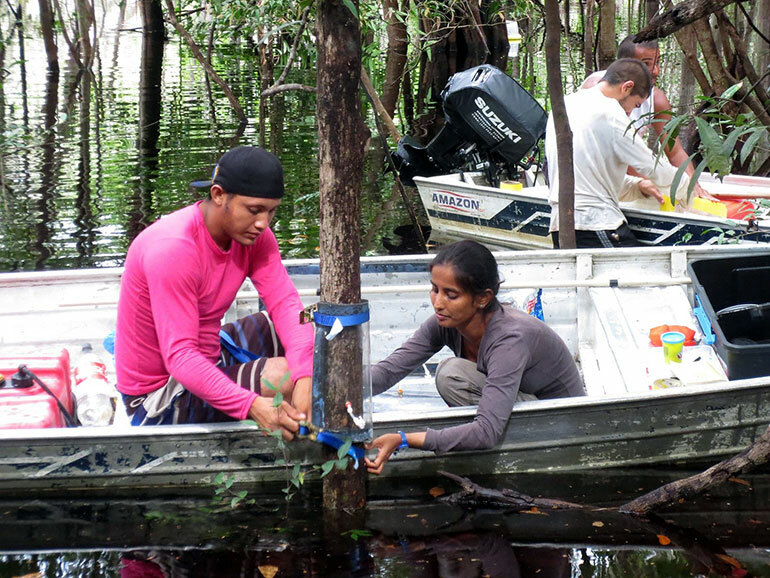 The problem was that when researchers went to the rainforest to collect gas samples from wetlands and other sources, they could only account for about half of that amount. Were there any ideas where the extra methane was coming from? There were a few different thoughts over the years, some more plausible than others. They ranged from termites to biomass burning, even UV-light-induced production of methane from plants. These sources were all studied but could not account for the extra 20 million tonnes. What did this study discover? It turns out that trees in the Amazonian floodplain act as “chimneys.” They vent methane produced in the soil when their roots become submerged in water, which is common during the rainy seasons. Their roots need oxygen to survive so wetland trees have developed an adaptation that allows them to enlarge pores in their stems to increase airflow to their roots. A side effect is that methane produced by micro-organisms in water-logged soil leaks out to the atmosphere through the same openings. How did you help make this discovery? The project was led by colleagues Vincent Gauci at The Open University and Sunitha Pangala, who is now a research fellow at Lancaster University. Pangala carried out the fieldwork in the Amazon when she was a post-doctoral researcher at the OU. She measured gas emissions from the trunks of more than 2,300 floodplain trees and found that when their roots were submerged, the trees vented the full 20 million tonnes of methane that had not been accounted for. My role was to “fingerprint” the methane using carbon isotopes—slightly different ‘heavy’ and ‘light’ versions of carbon that occur naturally—to help establish where the methane was coming from. Methane is a powerful greenhouse gas that contributes to climate change. It’s important that we understand the natural sources of these emissions as well as the human-caused sources, which remain the biggest contributors of greenhouse gases. Twenty million tonnes of methane from one region is a big gap in knowledge. Now that we understand this natural process more fully, it can help us plan our resource management in ways that reduce human-caused emissions. For example, there are lessons we can apply to the construction of hydroelectric dams, which in the tropics commonly flood large areas of forest. We know that wetland trees can survive for years in flooded terrain and could end up venting methane produced from the considerable organic material that is submerged in reservoirs. It’s important to note, though, that this research is not suggesting floodplain trees are bad for the environment—it’s providing insight into how natural forests function.